A normal project to remove unused bicycles from outside the train station in the town of Slagelse went awry. The police 'nicked' a whole bunch of bikes. Like in many countries, bikes are taped around the wheel and, on the announced day of clearing up unused bikes, any bike with unbroken tape is removed. 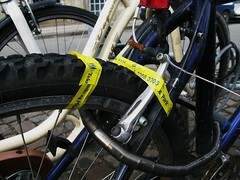 Alternatively, a tag is placed on the bicycle which the owner removes if it is in use. In Slagelse, however, it went a bit wrong and many bicycles that were still in use were removed by the police. One man who discovered his bicycle was gone called his insurance company and informed them that his bike was taken but he knew who took it. The insurance company said that the bicycle wasn't stolen if the police took it. Normally, everything would end happily, since the city keeps the bikes in storage for some weeks before they're either destroyed or sold at auctions. This time, however, the bikes were driven straight to the landfill. The problem of responsibility remains. Danish State Railways and Slagelse city agree that the police officer on the scene who decided which bikes were to be removed is responsible. 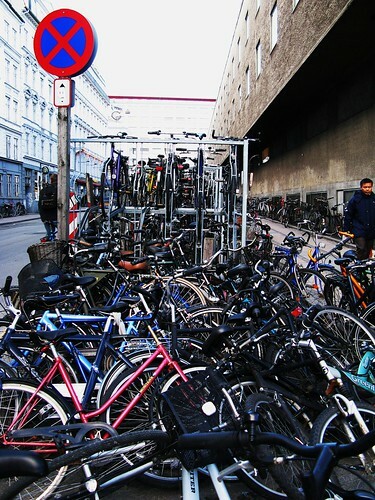 400,000 bicycles are scrapped each year in Denmark. Plus a few extra this year in Slagelse.